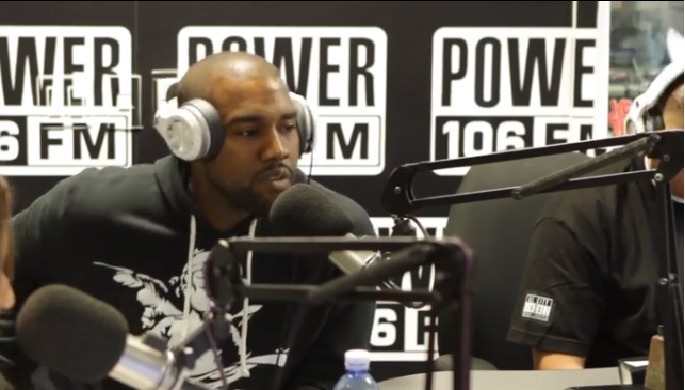 Kanye West decides to kick a freestyle for listeners on his recent visit to radio station Power 106 for an interview with Big Boy. Take a look as Yeezy keeps it straight skills and decides to drop bars off the top of the dome over the instrumental to “Clique” which is featured on his G.O.O.D. Music label’s compilation album Cruel Summer. Towards the end, the DJ decides to slip in Kanye’s “Through The Wire” instrumental to which Kanye stops spitting and explains the beat isn’t exactly accommodating for a freestyle. This entry was posted in In The Studio, Live Performance, Miscallenous, Video and tagged big boy, clique, freestyle, hip hop, Interview, Kanye west, power 106, radio, rap, Yeezus, Yeezy. Bookmark the permalink.